Exquisitely soft and artfully designed by makeup artist Wayne Goss, this limited edition powder brush is the one tool you need to sculpt, buff, and bake your way to a flawless, airbrushed look. Use with your favorite powder products to easily achieve a sculpted, airbrushed look. When angled on its thin side, The Air-Brush creates a sharp contour line. The tapered tip can be used to apply highlighter to targeted areas. Sweep blush and bronzer onto the cheeks with the large flat side. Buff powder into skin or blend away lines by moving the brush in circular motions with light pressure. I want to send a very special shout out to Bess at Beautylish. Wayne's brush was launching the day I was having surgery. Not sure of how long I would be out of commission I asked if I could pre-order the brush. Bess, going above and beyond, ordered the brush for me the day it came out. It arrived today with a special note wishing me a speedy recovery. Right now I can only hold it and admire its beauty and feel the softness of the bristles. I can't wait to use it and give you a more thorough review. I just want to let everyone know that Beautylish has the best customer service one could every want. DON'T USE TO SET CREAMS!!! This brush is wonderful and I will post a full comprehensive review soon but the following needs to be clearly stated for anyone who uses this brush: Blue Squirrel hair is not like other bristles, and should not be used to set cream or liquid foundations or concealers. If you set your concealer/foundation with this brush it will soak up the oils in the product, and this will severely damage the very delicate bristles!!! (This causes breakage, splitting and shedding) Please do your research on this bristle type and take very good care of this brush! As a consumer in the cosmeceuticals industry, it is very important to be aware of what you are buying, so although its price may be deceiving, do not mistake this special gem for any ordinary powder brush! Don't sleep on this one!!! Okay, now that my disclaimer is out of the way (see my last note on this product) I can continue on with the review of what I am sure will be one of my most frequently used brushes. This brush is more delicate than your average makeup tool and it shows from the moment you get your hands on it! This is my first foray in to Wayne's line and after this experience I strongly doubt it will be my last! First things first: the price. For the quality and bristle type, the price of this brush is truly unheard of in terms of affordability. If and when this brush restocks, do NOT miss out! Many similar-sized blue squirrel brushes from other companies cost twice as much (and more) than this little wonder, making it an insane value for what you are getting! I only own one other blue squirrel hair brush (Hakuhodo K002) and while the K002 is larger and more full, it cost me 83 bucks, so this is a welcome change in price point. When the Air-Brush arrived, I was very excited to test it next to my K002 to determine whether or not there was any discernible difference in the quality of the brushes. I was unable to notice a difference among the respective bristles, which says to me that Wayne Goss has managed to curate a brush with the same level of quality as luxury and artisan brushcrafters, many who already have years of experience in the game. 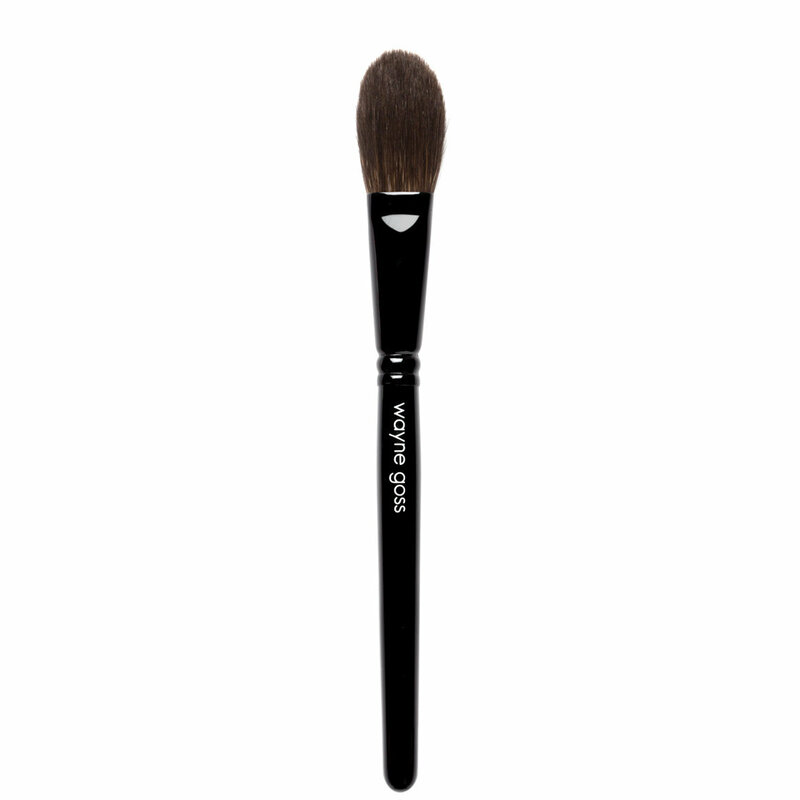 This brush can apply any powder product with ease and control. Blue Squirrel hair is very soft, and as a result it picks up product much more gently, which equates to a more subtle and buildable effect. I would not use this brush to localize a heavy concentration of product -- The Air-Brush lends itself more to the act of blending and 'buffing' to create a truly AIR-BRUSHED (see what I did there?) effect. If you have any highly pigmented products that you've been staying away from, try them out with this bad boy. This brush is a godsend for any highlighting product -- even Jeffree Star's Skin Frost, which is undoubtedly one of the most high-impact formulas currently on the market. I have slightly lighter skin (I'm a RCMA Gena Beige) with strong pink undertones, so when I use Ice Cold, it has a tendency to lean VERY silver on me. I bought the Morphe M510 (Jeffree's HG highlighter brush) and I've never been happy with how it applies Skin Frost. I have a fan brush from Hakuhodo that sort of does the job, but Wayne's Air-Brush is the most effective tool I have ever used for creating highlights at MY pace, instead of putting on too much and trying to fix it. (which seldom works out, let's be honest.) If this brush restocks, I might just have to buy ANOTHER. I have seen a couple people on Temptalia and other places post that they were so blown away they ordered 2. After getting to use this fantastic brush, I can understand why. This Summer has truly been one of many outstanding cosmetics releases, and Wayne has staked his claim as one of 2016's cosmeceutical powerhouses. Good on you, sir! Wayne is really keeping pace with the finest Japanese brush makers. It's a pretty impressive feat considering they have been in the brush for decades and he's just on year 4. This 100% blue squirrel Air-Brush pretty much takes that cake as far as brushes go. Not only is it the softest brush on the market it's unique shape makes it perfect for a long list of jobs! He designed it to be the perfect buffing brush, but I find that it hugs the hollow of your cheek in an ideal manner to give a beautifully diffused contour. Then flip it over and use the flat side to feather on your blush to get a seamless flow from your contour. And you can finish off your cheek by using the slightly more angled side to whisper the perfect amount of highlight onto your cheek bone. I have a full video review that you can find in my profile here on the site! I hope you didn't miss out on getting this Limited Edition brush! I am surprised that no one has mentioned that fact the head of this brush is very small and thin. Don't get me wrong, it's soft as hell. I love that part. But, the size of the brush is almost too small for blush and powder, in my opinion. It works great with contour and highlighter, but blush and full on powder is pushing it. Maybe I'm just used to super full brushes, I don't know, but when I opened it up I was disappointed. It's almost in between an eye brush and a face brush. It's like just the wrong size. I'm going to keep it and use it for the purposes mentioned, but for those expecting a good size brush head be forewarned. Really soft but sheds to high heaven! This brush really is the softest brush I have ever used. It is a small brush so if you like bigger brushes such as face powder brushes, you won't like this one. I rarely contour so I don't use it for that. I used it for light blush application for highly pigmented blushes and I used it for all over powder. I like it best for lightly powdering the face because I tend to be heavy handed and this helps me with control. Again, it is not a large brush and not heavily dense which is what I wanted but if that is what you want, pass this brush up because you will be disappointed. The reason I gave three stars is because it does shed, all over. I have to pick black hairs off my face everytime I use it which is a real pain. If it didn't shed I would rate it better especially for 35 dollars and it being a designer brush. If WG fixes the shedding issue it will be worth the money but I would not repurchase it for that reason because this brush cannot afford to loose hairs. So if you don't mind the small size and picking hairs off your face when applying powder go for it as it really is the softest brush out there. Long story short, everyone NEEDS TO HAVE this brush. blusher, contour, highlight, powder, bronzing, all with the one brush. Even if you're on a budget, a real techniques blush brush, setting brush, and sculpting brush cost about $29. What every morphe affliates are using (M510/M310+M527+E4+Whatever) are also near and over the price of this baby. Just do the math. What about a suqqu cheek brush? I feel like the softness of these two is on the same level. Top-notch. But why break your bank while you can have it a quarter the price, if not more affordable? I personally wear makeup quite often because of the face demons i have going on. The brush i only need is a Wayne Goss 13 and this. Before i'm using the no.2 brush and now my no.2 can take a little break. I admit - I was very skeptical that something this shape and density, described as being ultra soft, would work effectively to buff out powder. I am used to using a flat top brush that is quite dense for this (and had been very happy with it). I used it with blush, contour, highlight and bronzer, and also with translucent powder to buff it all in. VERY impressed at how beautifully everything applied and at how perfect it all looked. Also kudos to Beautylish's Bess, who made the ordering process painless and was an absolute pleasure to work with - you are a credit to the company, which already has an ultra high standard of customer service. Five stars to Wayne and Bess for this fab brush, and helping me get it so quickly. This brush is amazing. 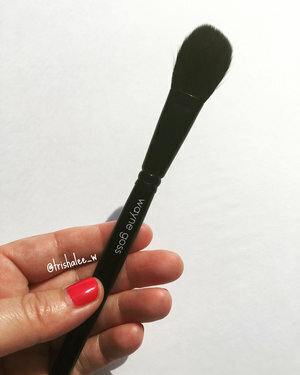 It is the softest wayne goss brush I own. It's the perfect size for highlight, contour, or blush. I hope wayne starts making more brushes like this one. I only bought this brush but I wish I had bought a back up because its that good.